Tony DiTerlizzi, Never Abandon Imagination, 2017. Acryla Gouache on Bristol board. Illustration for Norman Rockwell Museum exhibition. ©Tony DiTerlizzi. All rights reserved. Stockbridge, MA, April 13, 2018—Norman Rockwell Museum will present a family day with artist Tony DiTerlizzi on Sunday, May 27, from 1 to 4 p.m. to celebrate the final weekend of its current exhibition of the illustrator’s work. The special closing event will feature drawing demonstrations, exhibition tours, readings, and a talk and book signing by the artist. The family day is free for Museum members, children 18 and under, or included with Museum admission. 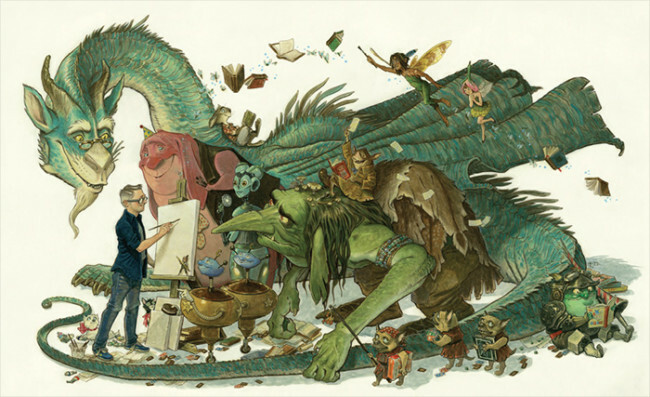 Known for his successful book series The Spiderwick Chronicles, Tony DiTerlizzi is widely celebrated for his images of such fantasy creatures as fairies, trolls, sprites, and goblins. Never Abandon Imagination showcases over 150 original paintings and drawings, from the games Dungeons & Dragons and Magic: The Gathering, to his many fantasy and children’s books, in addition to artworks from his childhood and college years. The exhibition highlights the artist’s influences and artistic process, and includes original art from such award-winning books as The Spiderwick Chronicles; Ted; The Spider and the Fly; The Story of Diva and Flea; and The WondLa Trilogy, which have inspired a new generation of young readers. The exhibition is sponsored in part by The Keator Group, LLC and The Pittsfield Cooperative Bank. Additional support provided by Simon & Schuster, Disney Publishing Worldwide, Gotham Group, The Max & Victoria Dreyfus Foundation, and The Dr. Robert C. and Tina Sohn Foundation. Media sponsor: WGBY Public Television.